Primula bulleyana is one of a group known as Candelabra Primula, so called because of the tiered arrangement of their flowers, similar to a candelabrum. The flowering stems are up to 50–60cm long, rising in groups from a rosette of leaves 12–35cm long and 3–10cm broad. The orange-yellow flowers are arranged in tiers. 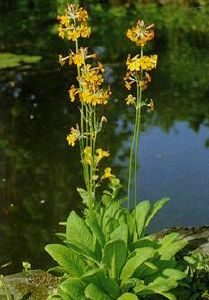 It thrives in a bright, moist environment, such as beside a pond. Primula are herbaceous or semi-evergreen perennials, forming a basal rosette of simple leaves, with bell-shaped flowers which may be solitary or carried in an umbel or in whorls on an erect stem. Proliferae or Candelabra section primulas are moisture-loving, herbaceous or semi-evergreen perennials forming a rosette of basal leaves, with erect stems each carrying several whorls of salver-shaped flowers. Primula bulleyana was first introduced by George Forrest from Yunnan province, China, in 1906, and named after Arthur K Bulley, his first sponsor, who was a cotton broker from Liverpool and a keen amateur gardener. He founded the Bees Ltd nursery and was responsible for the introduction of many hardy plants and alpines to Britain in the early 20th century. Grow in partial shade, in deep, humus-rich, moist, neutral to acid loam soil, or peaty soil. Tolerates full sun if soil remains moist at all times.